I finished listening to Saving Truth by Abdu Murray, narrated by Tom Parks on my Audible app. It’s a good listen for any follower of Jesus, while being a good reminder on how Christians should be interacting in today’s world. We love each other because he loved us first. We love each other because he loved us first. 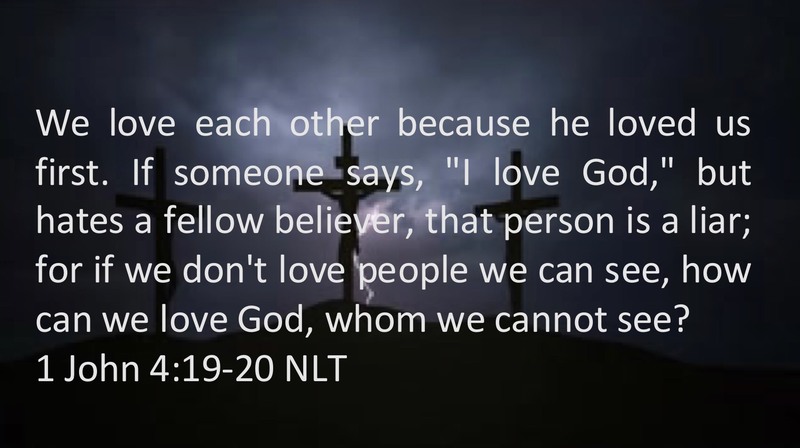 If someone says, "I love God," but hates a fellow believer, that person is a liar; for if we don’t love people we can see, how can we love God, whom we cannot see? Dear friends, let us continue to love one another, for love comes from God. Anyone who loves is a child of God and knows God. But anyone who does not love does not know God, for God is love. No one has ever seen God. But if we love each other, God lives in us, and his love is brought to full expression in us. LET MY LOVE ENFOLD YOU in the radiance of My Glory. Sit still in the Light of My Presence, and receive My Peace. These quiet moments with Me transcend time, accomplishing far more than you can imagine. Bring Me the sacrifice of your time, and watch to see how abundantly I bless you and your loved ones. Through the intimacy of our relationship, you are being transformed from the inside out. As you keep your focus on Me, I form you into the one I desire you to be. Your part is to yield to My creative work in you, neither resisting it nor trying to speed it up. Enjoy the tempo of a God-breathed life by letting Me set the pace. Hold My hand in childlike trust, and the way before you will open up step by step. Through Jesus, therefore, let us continually offer to God a sacrifice of praise—the fruit of lips that confess his name. Yet I am always with you; you hold me by my right hand. You guide me with your counsel, and afterward you will take me into glory. I was awakened to my spirituality and faith in August of 2002 when my son told me about an interaction he had with his football coach in between two a day practices that day. At that moment it was as if God had reached down and slapped me across my face, I felt immediately convicted for all I had done wrong and failed to do right. We went to Church that following Sunday together as never before and since that day the way I look at life under the sun, at being a father and husband as never been the same. Holy Week Timeline Resurrection Sunday - He isn't here! He is risen from the dead, just as he said would happen. Come, see where his body was lying. The same power that raised Jesus from the dead, lives in you. The world’s way of pursuing riches is grasping and hoarding. You attain My riches by letting go and giving.